So, the Board of Deputies has a new president. Will anything change? This remains to be seen. We believe the most important change that's required is for the Board to return to its prime directive – which is to speak for British Jews. We were reviled by the admission of Yachad to the Board four years ago, and by a 2/3rds majority to boot. 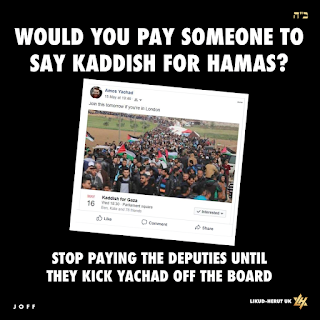 Yachad’s representative on the Board is Amos Schonfeld – he’s the guy inviting people to say Kaddish for Arabs sent by Hamas to ‘tear out the hearts of the Jews from their bodies’. This for us is a last straw. To paraphrase Groucho Marx (though this is far from funny): we should not be part of a club which has Yachad and the likes of Amos Schonfeld as a member. 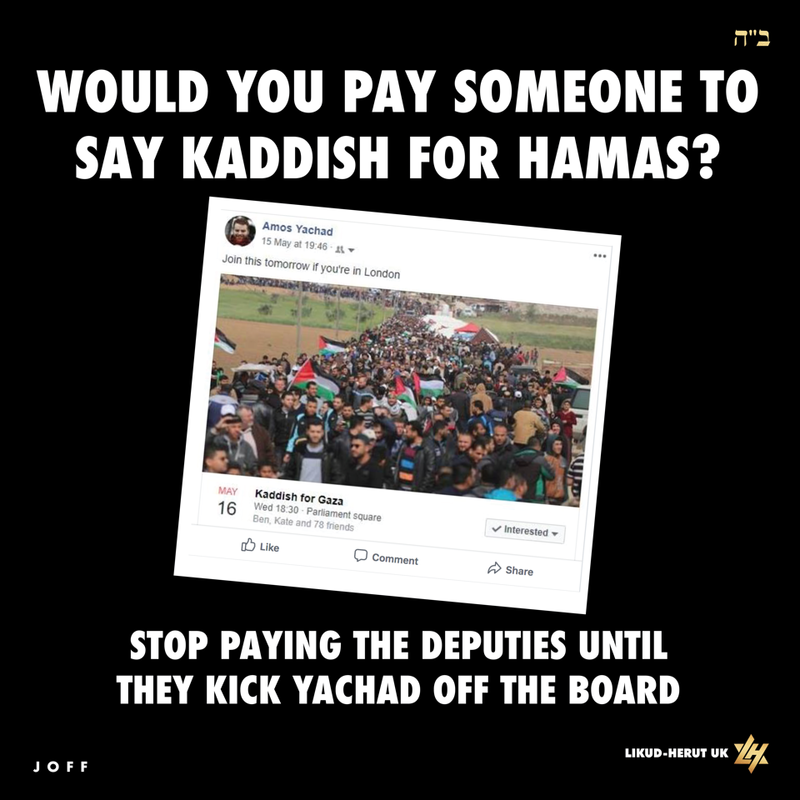 Yachad is an organisation that seems to champion the rights of the Palestinian resistance over and above the rights and security of Israelis (both Jewish and Arab) whose army and security forces are singled out for slander, double-standards and outright lies. In some ways it is worse than the Neturei Karta who demonstrate alongside the PLO, usually on shabbat. The NK openly opposes the State of Israel, whilst Yachad claims to support it. Except perhaps for Israel being a democracy. Yachad seems to think they know better about Israel’s security needs than the voters who elected the government, and they are prepared to shout their opposition into the willing ears of Jew haters in this country. People like Schonfeld are most useful idiots of all. Yachad openly partners with NGOs which are funded by foreign governments and special interest groups who seem bent on destabilising the democratically elected government of Israel, demonizing its army and exposing its leadership, past and present, to foreign arrest warrants using lawfare. It partners with ‘Yesh Din’, which it calls a human rights organisation. This was formed by the founders of ‘Machsom Watch’ which was set up to harass and videotape IDF border guards manning security checkpoints. Yesh Din has been richly endowed by foreign governments like Norway, Germany and Ireland as well as by other ‘friends’ like Oxfam. Another of Yachad’s bedfellows is ‘Breaking the Silence’ which it calls ‘an IDF veterans association’. Except that its sole purpose appears to be the defamation of the brave fighting men and women of the IDF. Like Yesh Din, it has an annual budget of around 6 million shekels, more than half of which is funded by foreign governments. Some of these donations are performance-based, depending on how much incriminating evidence can be uncovered against the IDF. Last year ‘Breaking the Silence’ was exposed in open court for fabricating an Arab’s abuse claim against an IDF soldier. So, we ask members of the United Synagogue – whose membership fees include a voluntary contribution to the upkeep of the Board of Deputies: Do you really want your money used as a platform to legitimise the likes of Yachad? Do Deputies like Amos Schonfeld speak for you? If the answer is NO, perhaps you should withhold your voluntary contribution to the Board of Deputies until Yachad are expelled for bringing it into disrepute? 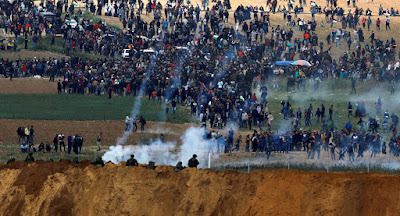 You may have caused needless deaths and injuries to Gazans, but your border campaign has done an enormous service to Israel. You see, until now, the peaceniks were happy to see Israel’s borders rolled right back to the pre-1967 lines. Sipping decaf lattes in Tel Aviv, they didn’t pay much mind to such details as borders. So long as there was a handshake and kumbaya with Mr Abbas, all was going to work out just fine. 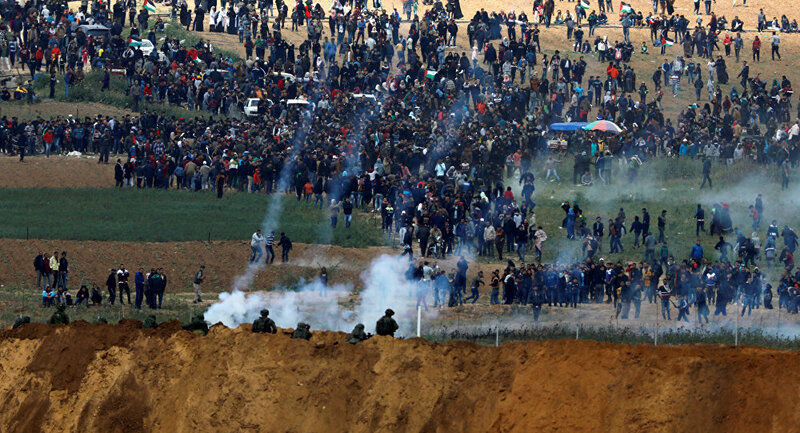 That was until they saw your mob of 40,000 at the Gaza border. Through the belching smoke of burning tires, they glimpsed pure murder in the eyes of your ‘civilians’. They read about the maps and knives that you’d given to infiltrators directing them to the nearest Israeli homes with orders to slaughter anyone in sight – man, woman or child. These Haaretz-reading elites may never have cared much for what happened down in Sderot, but right now, they are very wary of seeing your rabid mobs a lot closer to home. Pre-1967, Israel had a tempting waistline just nine miles wide at its narrowest point and Jerusalem was surrounded on three sides by your people. The peaceniks now have this horrible vision of returning from Pesach holidays in Turkey and flying into Ben Gurion over a pall of burning tires, just seconds away from the runway, not knowing what kind of missiles your jihadists might be aiming at the belly of their aircraft. They worry about burning kites wafting into the fields of Hadera over the new 1967 border, which might now bring Netanya into mortar range. And they worry about what the future might hold. Perhaps cheap drones launched over the fence carrying Sarin or Novichok a few miles into Tel Aviv. Of course we on the Right, the realists, have always known that ‘land-for-peace’ was just an illusion and that the only border acceptable to you people was always the sea, with the Jews inside it. But your two-week show has woken up the dreamers in Israel. They’re now smelling the coffee, or the burning rubber. They will now think twice before signing up to what Abba Eban referred to as Auschwitz Borders. So thanks for that Hamas, we on the Right are most grateful for promoting reality in Israel’s lofty circles. 51 years ago our people learned an important lesson about themselves and their destiny. It started in a cleaners’ room in the basement of the Knesset to which the 1967 war cabinet had evacuated under Jordanian artillery shelling. On the way in, Menachem Begin took prime minister Levi Eshkol to one side and said: “We should discuss liberating the Old City”. Israel had pressed Jordan to stay out of the war if they knew what was good for them but Egypt’s President Nasser had convinced the Jordanian king that he was actually winning the war and pressed for continued shelling and pressure on West Jerusalem. Begin saw the perfect opening and opportunity to liberate the Temple Mount and Old City, with full legal justification as territory captured in a defensive war. And from that tiny basement room came the order to retake Yerushalayim. Al Tirah Avdi Yaakov. Fear not Jacob … God is with you. The significance of this lesson should not be lost on us today. For, between those heady days of such a stunning victory in 6 days, the trebling of our territory and reunification of our eternal capital under the flag if Israel … between those days and now, we have seen repeated efforts to surrender those very territories, and out of nothing but fear. Fear of American presidents, European sanctions, BDS and, most of all, fear that the West Bank Arabs would turn us into a minority in our own democracy. As the old saying goes: We have nothing to fear but fear itself. And so, for all those reasons, leaders like Barak and Olmert tried to outdo themselves in offering the surrender of 96 percent, 97 percent … as if they were talking about so much body fat they couldn’t wait to shed. Barak handed over South Lebanon to Hezbollah and Sharon gifted Gush Katif to Hamas. As for Olmert, he was prepared to cede Jewish sovereignty over Jerusalem to international control, and give the Golan back to the Assad family. Just imagine Iran’s Kuds Force staring down from the Golan Heights today! Sharon paid for his mistake with his life. Olmert with the ignominy of jail time. The heavenly jury is still out on Barak. But the message is simple: don't mess with the promised land. And true enough, relief and deliverance - Revach Ve’hatzalah – did indeed come from another place. And this was in the form of Donald Trump. The lesson of Yom Yerushalayim is to keep saying: “Yes, we can do this!” This is our time in history. We have been blessed as the generation which lived to see the liberation of our homeland. We must not fail our children as its custodians. With God’s help we have seen off every mortal threat deployed against us, from rockets to tunnels to burning kites. And with the miracle of the Israeli birth rate having overtaken the Arabs’, we will debunk the demographic threat as well. Jerusalem, the light of the world – ours forever. It’s been an awful week for the ayatollahs. 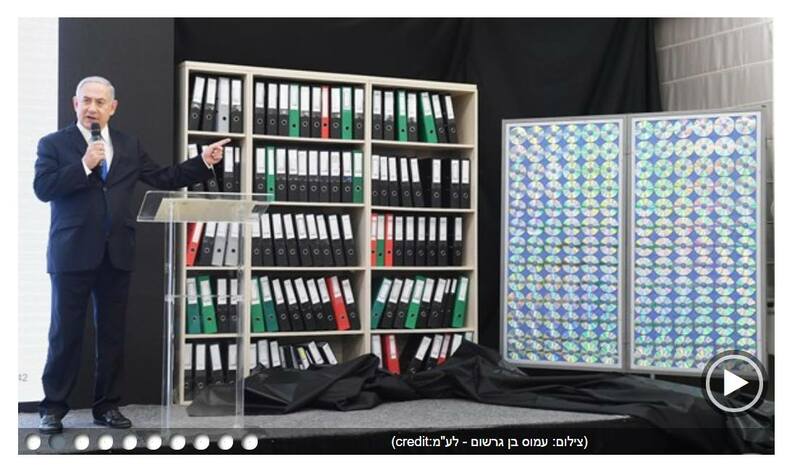 Reeling from the embarrassment of Mossad’s theft of their most secret nuclear archives, they thought they would lob a few missiles into the Golan to save face. In return they saw all their bases wiped off the Syrian map in under an hour. 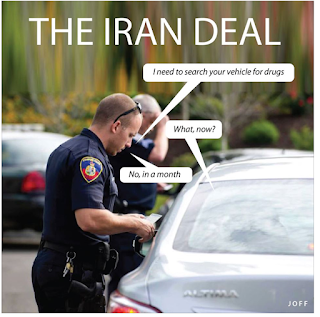 But it’s also been a terrible week for Germany, France and Britain who were such willing accomplices to the Iran deal. Obama needed it for his legacy. The Europeans wanted it for billions in export orders, and the-devil-may-care about Israel or nuclear Armageddon. The 3Ms, Merkel, Macron and May now find themselves vigorously defending the evil regime in its protests against Trump. “Bad faith” they call it. Totally ignoring that the deal was built on Iranian lies and deception, ignoring that the $150bn released to the regime was immediately invested in the export of terror and death to Syria, Lebanon, Yemen and Gaza – not to mention the development of nuclear-capable ICBMs with ‘Death to Israel’ written on them. Bad faith deserves bad faith in return. The irony is that the ayatollahs are now threatening to resume enrichment of uranium to spite Trump. But in doing so, they will have painted the Europeans into a corner where they can no longer justify the deal with the regime in breach. Britain has a bitter history of turning a blind eye to reality and paying a heavy price down the road. You only have to look at Chamberlain’s appeasement of Hitler in 1938, and his censorship of bad news from Europe in order to sell his worthless piece of paper to the British public as ‘peace in our time’. That deception ultimately cost the loss of over 50 million lives in WW2. Then there is the whole EU edifice – also built on fakery and delusion. Countries like Greece, which were unable to meet the entry criteria for currency union, simply faked their financials. The EU grandees, eager for more countries to add critical mass to their powerbase simply turned a blind eye and let them and other fakers join up. The result has come close to bankrupting the Euro. The EU is now a car crash in slow-motion, albeit the UK has had the sense to pull over into the service lane. Which brings us to Iran, with potentially the costliest endgame of all – under a mushroom cloud. 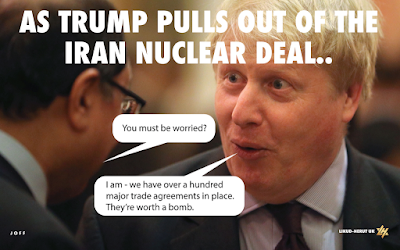 The JCPOA was a deal with the devil, and the devil really was in the details. No rights of peremptory inspection, no bar on ICBMs, no curb on the funding of terror proxies, payments in hard cash and, even then, the deal was never actually signed. The ayatollahs loath the West – and signing any contract with ‘Satan’ was ‘Haram’ …. never going to happen. It will be interesting to see how it all pans out for the 3Ms, with the wheels coming off their export orders under Trump’s sanctions. As the saying goes: you lie down with dogs and you wake up with fleas. Meanwhile the sun is shining in our blessed land as we approach the 51st anniversary of Jerusalem’s liberation from Arab occupation, and the formal opening of the United States embassy in our eternal capital city. Enjoy the ride folks – and Chag Yerushalayim Sameyach ! On the day we see American hostages brought home from N.Korea, I'll bet Nazanin Zaghari-Ratcliffe wishes she had Donald Trump as her president instead of having to rely on appeasers like Boris Johnson. Imagine if Britain had ordered a new £100 billion nuclear submarine. Imagine the money was handed over but no contract ever got signed. And then, at its first sea trial it sank. And that the government and media then said: "Oh, we knew all along it was full of holes". That my friends is Obama's Iran deal. 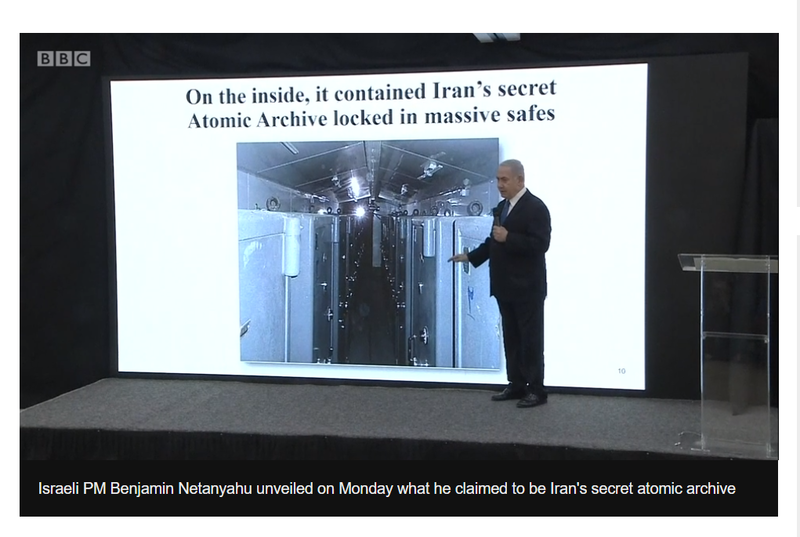 We now hear that Iran’s secret nuclear files were snatched from under their noses and flown out to Israel the very same day. This has to be the most audacious intelligence coup of the century. Israel has a record of hauling things home over long distances. In 1960 it took a kicking and screaming Adolf Eichmann 8,000 miles from Argentina to trial and eventual execution in Israel. In 1969 it defied a French arms embargo to take delivery of missile boats it had bought and paid for. Using a front company “Maritime Fruit Carriers” the boats were taken out of Cherbourg by the Mossad and brought to Haifa. In 1976 the IDF rescued 94 Entebbe hostages and flew them 2,500 miles back to Israel. You can watch ‘Homeland’ on Netflix and still find that fact is stranger than fiction. מי כעמך ישראל Who is like your people, Israel ? There is no question that Iran, so bloodied by Israeli attacks on its bases in Syria and utterly humiliated by the Mossad’s capture of their most secret files and proof of their lies, will be looking for a soft Jewish target for their vengeance – just like they did in Buenos Aires with the bombing of a Jewish community centre. One hopes that the CST has put out alerts and deployed extra security to protect our people over the coming weeks, and in the run-up to Ramadan. Brace yourselves for the blowback from Germany. This was a triumphant day for the Mossad and its unbelievably brave agents embedded with our most mortal enemies. Words cannot describe what the evil ayatollahs would have done with any one of them who had got caught. 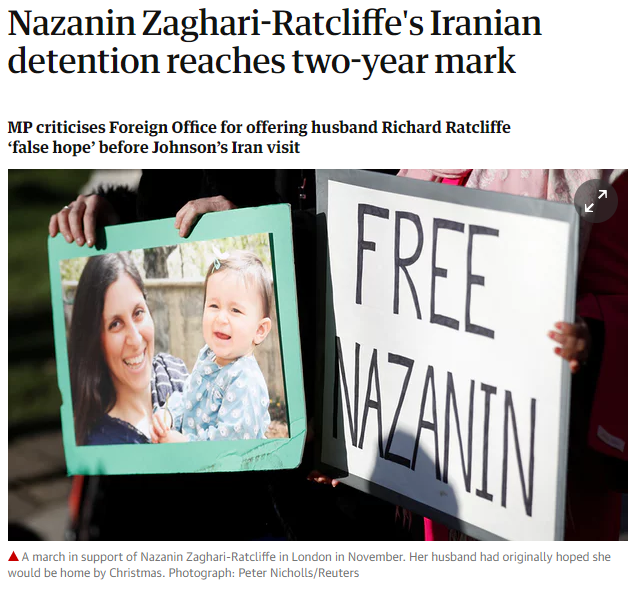 It’s bad enough what they do to their own citizens in their notorious Evin prison – especially the women. 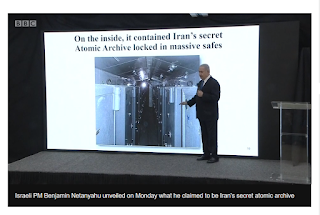 The photos inside Iran’s most secret nuclear archive would have been impressive enough, but then there was the video within its nuclear facilities – and finally the audacious theft of a ton of documentation and to have spirited it out of enemy territory is simply breathtaking. But, as is too often the case when Jews are sounding the fire alarm, much of the world will roll over and go back to sleep. And when it comes to Europe, there may even be blowback. The P5+1 countries who signed the Iran deal didn’t do so for world peace – less still to keep Israel safe. They did so purely for their own interests. Obama for his legacy, and the rest of them for billions in trade deals. 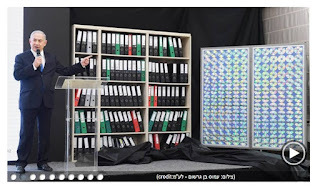 I foresee the biggest blowback coming from Germany, whose exports to Iran have mushroomed since Obama unlocked $150 billion in assets and - ignominiously - shipped the mullahs another $1.7 billion in ransom money in used banknotes of dollars, euros and Swiss francs. Germany is keen to restore its trade with Iran to the 5 billion euros worth of annual turnover that existed before sanctions were imposed. Just in the last few days it was announced that another three Iranian banks were opening up in Hamburg and Frankfurt. Now that the truth about Iran's apocalyptic intentions is out in the open and undeniable, this truly amounts to 'dealing with the devil'. Far from ‘peace in our time’ – for the likes of Mrs Merkel it’s about cash in our time. Let the next generation worry about the mushroom clouds that usher-in the coming of the hidden Imam.